The FX AlgoTrader FX Currency Strength Meter (Index Analyser) provides real time currency strength data direct to the trader's computer. The FX Strength Meter uses real time Index Data provided by the FX AlgoTrader server and is a Java based platform independent product. The FX Currency Strength Meter for FX Trading allows traders to make optimum fx pair selection which fit their own custom filter selection. The FX Currency Strength Meter is also an excellent way to monitor the currency market for optimum entry conditions while working on non-forex projects. Why is Index Analysis so powerful in fx trading? Currency index data provides traders with a unique ability to analyse the fx market from a macro level rather than analysing individual forex pairs. By comparing index data for all the major fx currencies over multiple timeframes traders are able to make accurate, quick and informed decisions regarding the best pairs to trade. No serious forex trader should be without some form of FX currency strength analysis or metering tool! 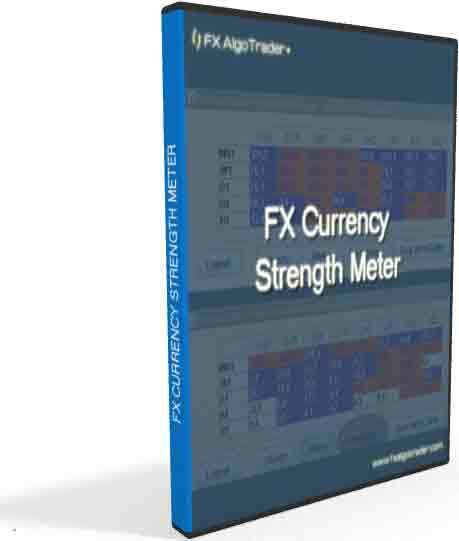 Where does the data come from for the FX Currency Strength Meter? 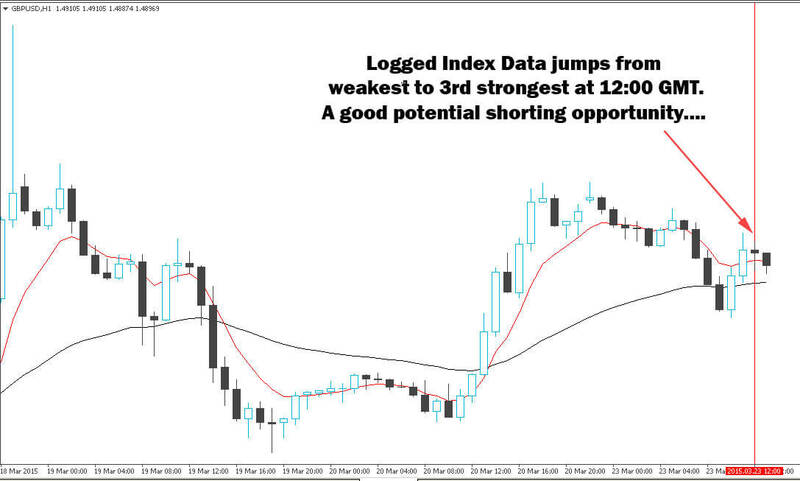 The data which the FX Currency Strength Meter uses comes from the FX AlgoTrader web server. The index data is calculated using the LFX currency index formulae published by the LiteForex brokerage service up until 2014. The Index data is calculated in real time from spot FX rates and streamed to the subscriber on their local machine. The FX Currency Strength Meter incorporates multi-timeframe filters which allow traders to see index data sorted into strength and weakness order by timeframe. Traders can also set filters for each timeframe so that they receive alerts when currencies fall within the tradr's custom filter criteria. How does the FX Currency Strength Meter filter system work? In the screenshot above we can see the FX Currency Strength Meter Monthly (MN1) row has a red background - this means it isn't included in the filter criteria. We can also see boxes with a green background on the Weekly (W1), Daily (D1), 4 hourly (H4) and hourly (H1), this represents our active filter area. To understand how the filter system works you need to know the difference between a 'currency' and a 'currency pair'. A 'currency' is a singular entity such as the Euro (EUR) or Sterling (GBP) whereas a 'currency pair' is made up of two 'currencies' eg EURGBP which represents... the Euro/Sterling exchange rate. For FX Currency Strength Meter to trigger an alert a currency pair must fall within the green shaded areas.......the weakest currency must fall into all the active filter timeframes in the weak zone (the left hand side) and the strongest currency must fall into all the actve filter timeframes in the strong zone (the right hand side)... The index data is sorted in real time into strength and weakness order where the strongest currencies are on the right hand side and the weakest are on the left hand side. So in the FX Currency Strength Meter screenshot below we can see GBP falls into all the active filter zone in the weakest currency area (the left hand side) and the USD falls into all the active filter zone for the strongest currencies (the right hand side). Therefore the GBPUSD is the ideal pair to short. When currencies meet the filter criteria the FX Currency Strength Meter produces an alert with a corresponding trigger time which is displayed in the Alerts table as shown below. The FX Currency Strength Meter now has a Yahoo email alert facility where any alerts sent to the Alert trigger table are also sent to the trader's designated Yahoo account. You can set up a Yahoo mail account for free anytime. 100% Trading Platform Independent - the FX Currency Strength Meter can sit on top of any Windows based applications - it is always visible. 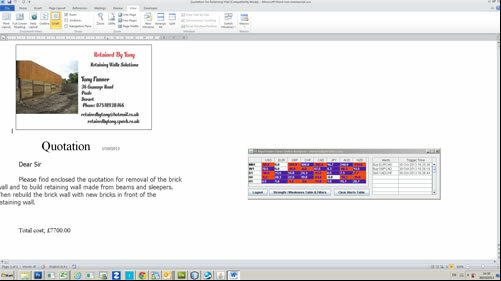 Colour coded gain indications - Red Cells indicate a negative index value, blue cells a positive index value and white cells represent no change. Color coded cells help traders see what's hot and what's not! Day Trader Settings - The screenshot above shows a potential filter set up for fx day traders. The trader has excluded the Monthly and Weekly Index data so that the active filters are only based on the Daily, 4 Hourly and Hourly timeframes. Using shorter timeframe filters allows the trader to take advantage of short duration trend changes/reversals etc but the trader should also factor in the long term trend and ensure their exit projections are before any significant price reaction points which could be price derived or technical support or resistance levels. The reason the trader excluded the hourly timeframe is very deliberate - using the system in this way allows the trader to take opportunity of short term hourly reversals where price action retests support or resistance levels in a strong trend.. aka 'buying a dip in an uptrend and 'selling a rally' in a downtrend. This is a brand new feature which provides real time data logging on all time frames. The system saves index data at a trader defined interval. This allows the trader to see how the currency index data is changing over time on the specific timeframe of choice. This new option gives the trader historical context when analysing real time index data for trading decisions. This is a very powerful new feature. Analysing the GBPUSD shows this being played out by price. 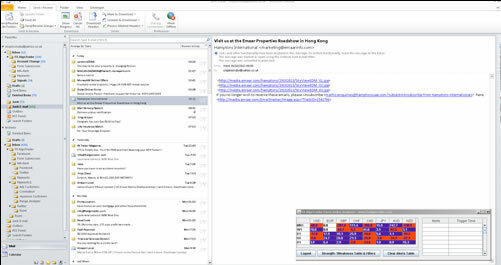 Email Alerts The newest release of the Index Analyzer has automated email alerts so traders can be assured they will always be alerted when the appropriate conditions in the market which meet their custom filter requirements occur. FX AlgoTrader Pivot Systems would allow the trader to refine their entry and exit plans for forex pair candidates generates by the FX Index Analyzer.